I caught flack from a buncha' B/X-bags for ignoring the existence of a Black Dougal in Moldvay's Basic Rulebook. But rather than ignore the trolls I've decided to acknowledge the existence of that other incarnation, mostly because I'm up to 'D' in the A to Zeppo challenge and, well, his last name starts with a D.
It should be noted that while Black Dougal of Adventure Log fame is--was--a Lawful Neutral Ranger, the Moldvanian Black DeGaulle was a thief. Regardless of class, neither survived his respective adventure, as Basic Black D successfully located a trap on a chest by jabbing his finger against the sharp needle built into the latch. This strategy might well have worked had he not failed his save and quickly succumbed to the poison the needle was impregnated with. 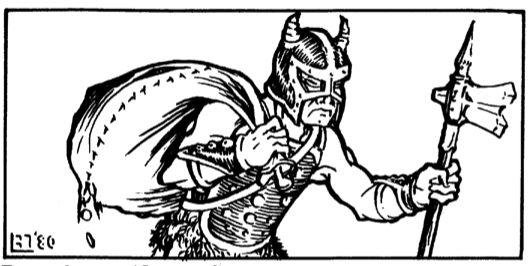 Black Dougal was not the only character to appear in both the Dungeon Master Adventure Log and the Moldvay Basic Rulebook. According to the Adventure Log, Black Dougal was part of a party of 10 people who included a few familiar faces such as the cleric Sister Rebecca, Morgan Ironwolf the fighter, and a dwarf named Fred 9802, who may be analagous to Frederick the dwarf from Moldvay's example of play. Black Dougal was listed as the character of Kevin Hendryx, an employee of TSR from back in the day, while Morgan Ironwolf was Tom Moldvay's character, Sister Rebecca was the character of Rebecca Moldvay, presumably related to Tom somehow, and Fred 9802 was the character of Dave Cook, author of the Expert D&D rulebook. I can't say with any certainlty that the Adventure Log character list is based on an actual gang of characters run by the players listed but if it is it makes one wonder why Mr. Hendryx's PC was singled out for death in both situations? I'd like to request "Flubbit the Wizard" for "F". He was first spotted in the Magic Mouth description in Greyhawk. He then reappeared in the Holmes Manuscript, but Gary changed his name to Malchor. So I guess "M" would work too. Just noticed this request. Sorry, Zenny. I'll have to look into Flubbit's career, see if htere's anything to it. Thanks for the tip.